With scenic views over the Portuguese countryside and a large private pool, Villa Vale Martins is a great choice for large groups. 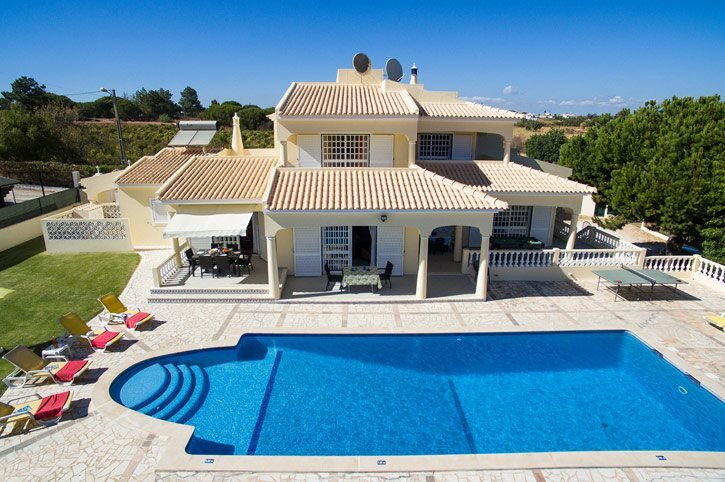 What's more, this 5 bedroom villa has a supermarket and places to eat within 10 minutes' walk, plus it's 5 minutes' drive from the centre of Olhos D'Agua, as well as Luisa Beach. If that isn't enough, the spectacular Sheraton Pine Cliffs Golf Resort is within easy reach too. WiFi, pool heating, and air conditioning/heating in the bedrooms and lounge are included. The large private swimming pool and spacious garden are great for relaxing in the Portuguese sun with a cool drink, whilst the children run around. The exterior table and chairs and brick BBQ are a welcome addition for dining alfresco day or night. What's not to love? A pool fence is available on request at an extra cost of £60. On the ground floor there's 1 twin bedroom with its own small yet private terrace and 2 double bedrooms, one of which has an en suite bathroom. Completing this floor there is a WC, bathroom and shower room. A marble staircase leads to the first floor with a large open landing and seating area. There's a triple bedroom with an en suite bathroom, a double bedroom and a separate bathroom. Both bedrooms and the hall all have their own private terraces with fabulous views over the Portuguese countryside. This villa has applied for a licence and the submission number is 2008/486. The licence number will follow. This Algarve villa is located north of Olhos D'Agua, which is a small, picturesque fishing village. Here, traditional Portuguese cottages hug the winding road that leads down to the beach, with its fishing boats and local cafes. The shops and restaurants of Acoteias and the famous Sheraton Pine Cliffs - a spectacular 9-hole golf course - are also within easy reach. Albufeira, 10 minutes away by car, offers a wide range of shops, bars and restaurants to suit every taste, and really comes to life at night with a great atmosphere as you dine. The nearest mini market is just a few minutes' drive away for some holiday essentials. There's a local produce market in nearby Olhos D'Agua Monday to Saturday, where you can pick up some goodies to take back to your villa for a BBQ. For some serious retail therapy, head to Algarve Shopping, a large commercial centre in Guia, 20 minutes' drive away. Olhos D'Agua is 5 minutes away by car with seafront restaurants and a few bars for you to sample. Alternatively, nearby Acoteias is a short stroll from the villa where you will find a cluster of restaurants serving International cuisine and a few bars. However, if you like the buzz of nightlife, the Strip at Praia D'Oura is also a little further along the coast. Maria Luisa Beach is just 3 miles away, where cliffs and pines on 3 sides add to the holiday atmosphere. Nearby there's a horse riding centre in Vale Navio and further afield, particularly for those with children, you'll find choice of waterslide parks within 25 minutes' drive. Sheraton Pine Cliffs Golf Course, perched on the cliff top above Falesia, is around 5 minutes away by car. There are plenty of golf courses to try in Vilamoura too. So don't forget you handicap card! If you travel 8 miles to the east you'll reach popular Vilamoura with a fabulous marina. Sports facilities offer something for all the family and include bowls and horse riding. For the less active, options include a stroll round the shops and restaurants in the marina or a visit to the casino. This area is also convenient for exploring the surrounding areas, with villages such as Boliqueime and Ferreiras providing a flavour of Portugal with an interesting selection of handicraft shops and restaurants, which will give you a taste of the rural way of life. For those wishing to explore the Algarve more widely, almost anywhere across the region can be easily reached by car. Villa Vale Martins is not available to book for season as it is sold out. Take a look here at the Algarve villas that are currently on sale. Opened in April 2001, this small and attractive 9 hole Executive Golf Course offers the opportunity to improve your iron shots, your short game and to test every golfer irrespective of handicap. Set around lakes, rolling hills and a mixture of pine and cork trees, from the first tee it presents a charming view of most of the course with the ribbon of blue sea as its background. This course requires pin point approaches, a fine touch around the greens and a solid putting stroke. This course tests the ability to control shot length and direction. 984 metres in length. 27 Par. Address: Balaia Golf Village, 8200 Albufeira Tel: 00 351 289 570 442/1 Fax: 00 351 289 570 470 Website: www.balaia.co.uk You can contact via website to pre-book. Situated in Santa Eulalia, Albufeira, Parque Aventura comprises of a paintball centre and various adventure courses through the trees made up of zip wires, bridges and ropes. The assault courses and games are suitable for children of 4 years and older with varying degrees of height and difficulty and are all supervised by qualified instructors. In 1963 an archaeologist made an exciting find on the northern side of the marina when fragments of Roman mosaic were spied in the soil. The spot turned out to be the remains of Cerro da Vila, where Romans, Visigoths and Moors all left their mark. Take a look at the water piping system and the surviving mosaics and enjoy the museum containing coins, vases and other artefacts uncovered here. STUNNING VILLA THAT WAS GREAT VALUE FOR MONEY AND EXCEEDED OUR EXPECTATIONS, THANK YOU.